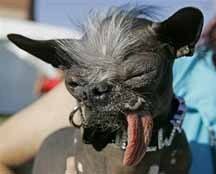 A 2-year old Chinese Crested and Chihuahua mix named Elmwood was crowned the World’s Ugliest Dog this past Friday. Elmwood’s owner Karen Quigley said, “she rescued Elwood two years ago. ‘The breeder was going to euthanize him because she thought he was too ugly to sell. '” And by ugly, she means ridiculously attractive. In other news, Jane Balogh registered her Australian shepherd-terrier mix to vote as a form of protest. “The second time Duncan M. MacDonald sent in an absentee ballot, an election worker in Federal Way called to ask about the paw print on the envelope. But it took three ballots before the prosecutor contacted the voting dog’s owner.” There’s no mention of his party affiliation. 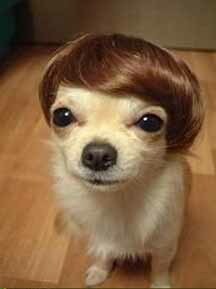 I suppose he’s either a Whig or a Tory. Entry filed under: dog, dogs, JUNE 2007, puppy, small dog, small dogs, voting, World's Ugliest Dog. 9 to 5 for service and devotion, you would think that i would deserve a fair promotion, want to move ahead but the boss wont seem to let me in, I swear sometimes that small dog is out to get me	One of these mornings, you’re gonna rise, rise up singing. You’re gonna spread your wings, small dog, and take, take to the sky. You have been sorely missed!!! Please post more pictures of small dogs in glasses.